Schreber, J.C.D. von. 1784. Die Säugthiere Plate 255. Boddeart, P. 1785. Camelopardalis giraffa. Elenchus Animalium 1: 174. Giraffa camelopardalis giraffa in Mammal Species of the World. 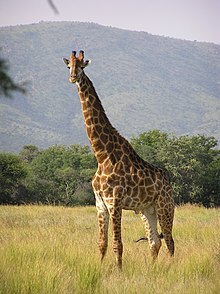 For more multimedia, look at Giraffa camelopardalis giraffa on Wikimedia Commons. This page was last edited on 6 April 2019, at 03:08.